Alesis Bloom sound in a pedal? Re: Alesis Bloom sound in a pedal? I don’t know of a pedal that does just that, but there are pedals with reverse reverb settings. The Eventide Space can do it. You just need a reverse delay or reverb that goes 100% wet and then feeds into a modulated hall reverb. The Blackhole setting as a starting point can do that without much tweaking. Or you could do it with two separate pedals if you can’t find a Midiverb II. Sure. 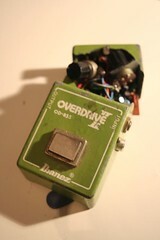 The 1st pedal needs an inverse envelope. It can be a delay or reverb, just 100% wet so it cuts off the attack. I like to set it in time with the music, but short, like 100-125ms, I think Bloom is 200ms, or the factory preset for #45 is. The 2nd pedal would be a Hall or Large Room setting, and the tails would be modulated. Again, set them in time with the music, 1500-2000ms range, I think the main Bloom setting is 1800ms or close to that. If you can control the Diffusion parameters set it around 50-75%. The Space has two independent reverbs, so it’s easy with the one pedal. The old rackmounts were 12-16 bit and had a grainy quality, the Space can account for that, not sure about a Boss type pedal. Quite a few of the old rackmount reverbs can do a Bloom style effect. I like the Roland DEP-5 a lot for this kind of thing. Polara in reverse with max decay into TC Trinity Sigur Ros toneorint and pretty darn close!! Thanks!